​May every step we take ​be one of peace !!! Our retreats are ongoing throughout the year. Email us and we will hold a room for you while you finalize your plans. Lodging is at a Boutique, family-run, Hotel in the heart of the old city, centrally located it is within walking distance of most sacred sites. ​Paolo & Paola serve a wonderful buffet breakfast and delicious homemade dinners. They can provide vegetarian, vegan, gluten free options as well !! Our guests refer to them as "the kindest people on earth" Enjoy views from almost every room to the Valley and setting sun !!! Lunch time on your own: There are amazing restaurants open all day throughout the town. We will give you a list of our favorites. Over 10 styles of salads in the main Piazza Comune alone, just steps from the Hotel. 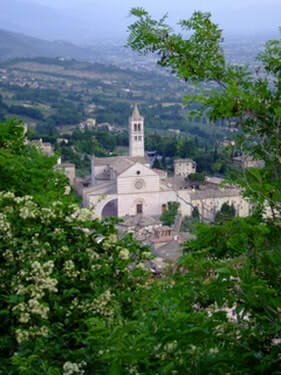 Some of the places you will visit: Tomb of St Francis, Cathedral of St Clare, San Damiano & the olive trees, Eremo della Carceri (Mountain caves of St Francis), Santa Maria delle Angeli, Birth place of St Francis and many many more. We answer all​ travel questions so that your journey is easy and enjoyable. In town, during free time, you can make a reservation for a massage or soaking in the ancient baths at Nun Spa a 10 minute walk from the Hotel. If you need to cancel please email us as soon as possible. Your non-refundable deposit can be transferred to another retreat with us if cancelled 5 weeks before the start of your retreat and is good for up to one year. If you cancel within five weeks of the retreat all fees are non-refundable and non transferable. People that are physically or emotionally challenged are asked to notify us in advance in order for us to determine if our retreat is appropriate.